Alternating with the ubiquitous red pinny, our dear girl wears this old raggy thing. It was mine once, a very long time ago. My mum made it for me as part of a pajama set. The bottoms were baggy bloomers in the same red gingham. When I grew out of them, the top part became a nightie for a bear…for over thirty years in fact! Then our kids were given the bear and our dear girl adopted the nightie. It is now not so spry. The white frill will probably never be white again. The gingham is shredding. She scampers about in it, barefoot and dirty in our Oklahoma dust bowl of a garden. It has been a very, very long hot summer here. The ground is bare and dry, a great many plants have died. John Steinbeck’s Grapes of Wrath has been on my mind recently – my sister-in-law just finished reading it for her book group. It is one of my most favourite books although I came to it quite late. It was a recommendation from my beloved during our courting days as we fell in love over Steinbeck, Billy Bragg and beer. 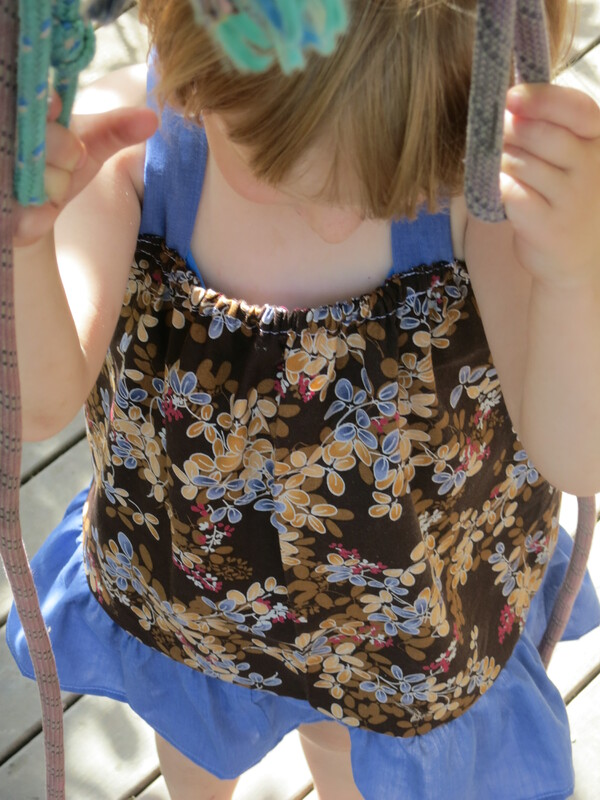 So here is the pattern and a wee tutorial for Okie Girl, a dress for a dusty summer. It is made from a cotton remnant and in true Okie style, a cut-up man’s shirt. You could actually get the whole thing out of the shirt quite easily. In fact, please do. It is just what Okie Girl would do. Cut out the pieces and prepare the bias binding if making it yourself. You will need approximately 90cm of bias binding and 36cm of 5mm elastic cut in half (18cm each). 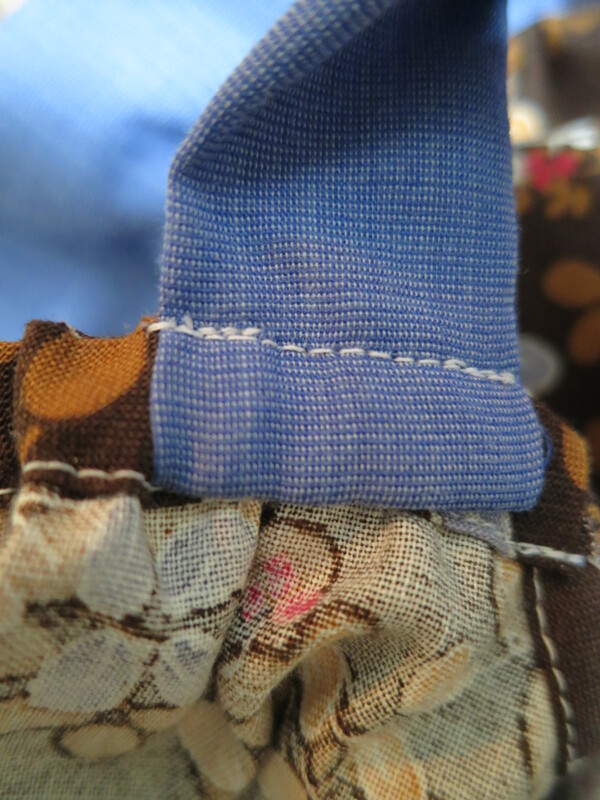 Attach bias binding to right side of arm holes and sew a 5mm seam, clip, press to the wrong side and top stitch down. 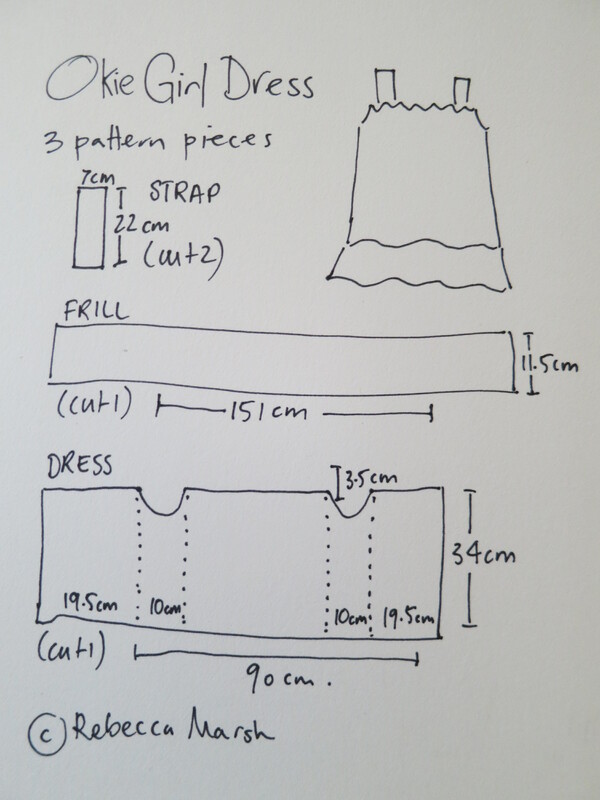 Fold dress right sides together, armholes matching and sew centre back seam. Finish seam and press. 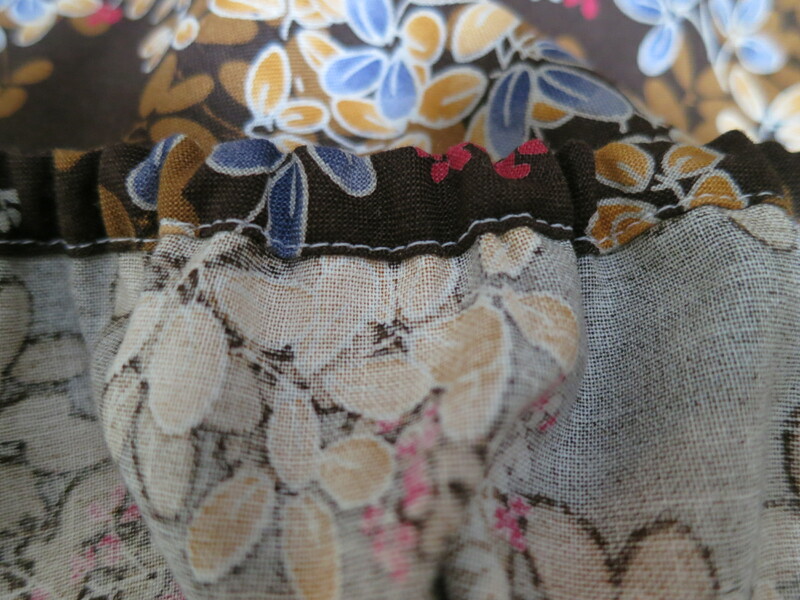 Attach bias binding to right side of dress front with a 5mm seam. Attach elastic as show at either end of seam, turn bias binding. Sew casing down enclosing the elastic, pulling it through as you need to keep the seam flat. Do the same for the dress back. 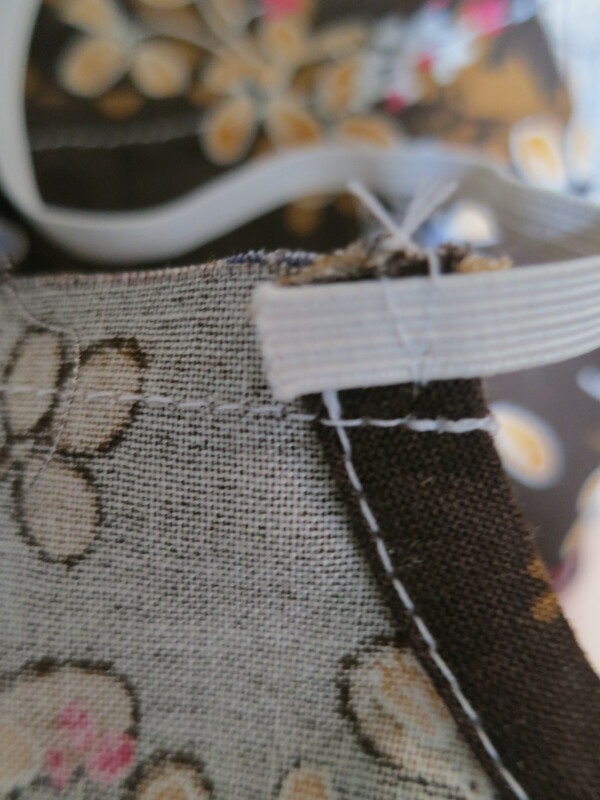 With right sides together sew the centre back seam on the frill. Finish seam and press. Turn over 5mm at hem of frill and turn again. Top stitch hem. 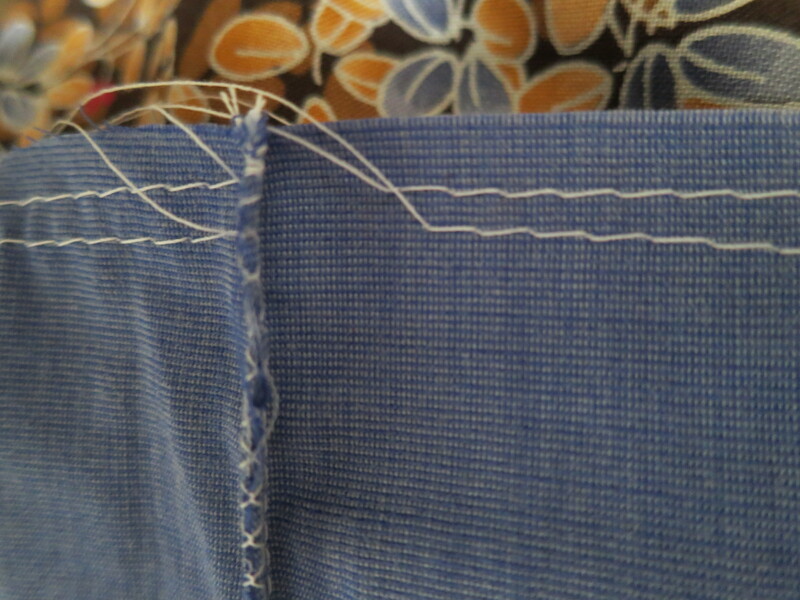 Sew two gathering lines of stitches (straight stitch at longest setting) 5mm apart around the top of the frill. Pull threads and gather to the circumference of the dress. Tie off gathers securely. 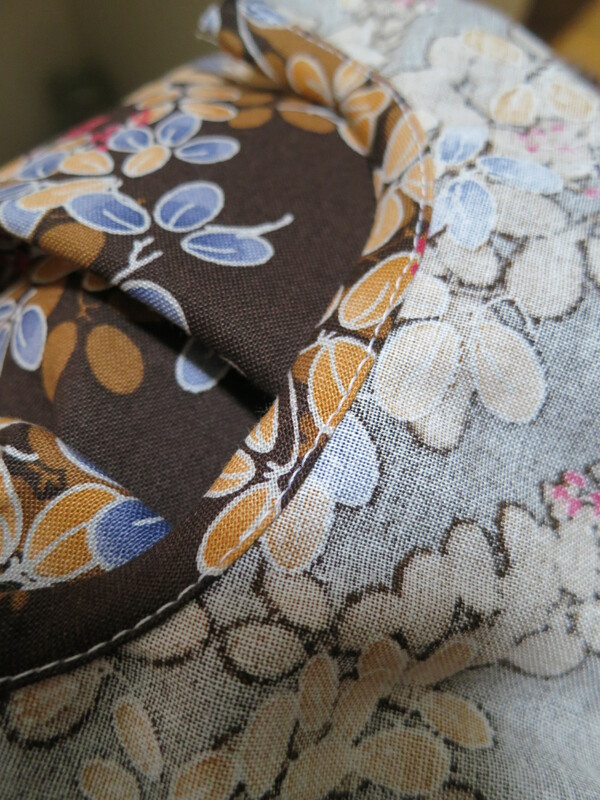 With right sides facing, attach frill to dress with a 15mm seam. Finish seam and press upwards towards the dress. 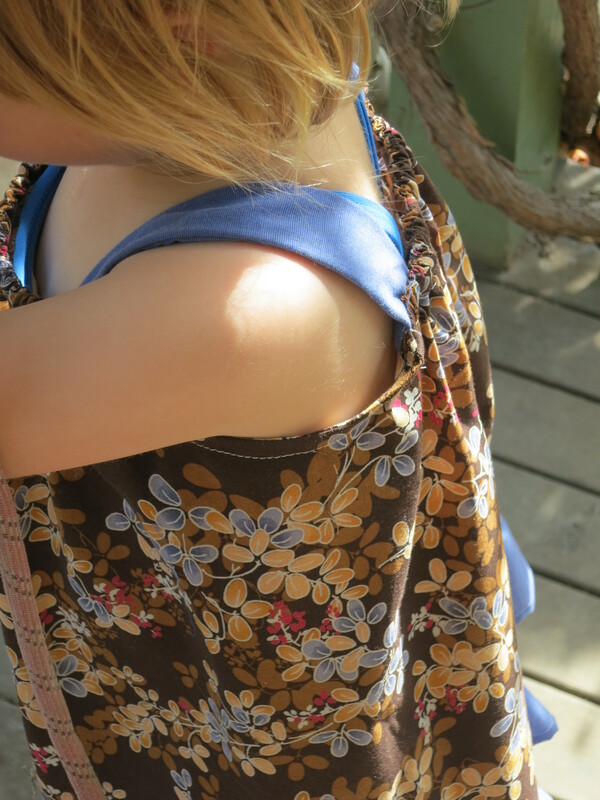 Fold shoulder straps in half length ways, right sides facing and sew a 5mm seam. Turn inside out and press. 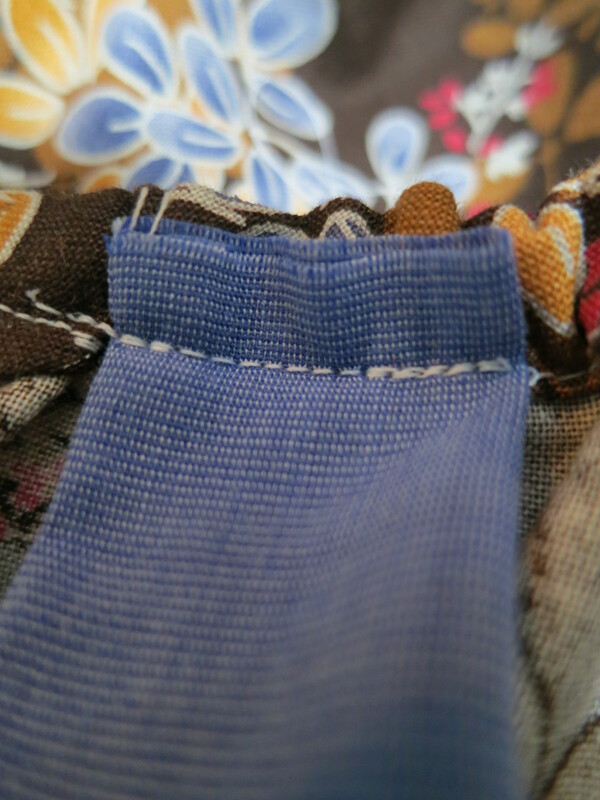 …then by pressing the shoulder strap upwards and top stitching along top edge of dress (sealing raw edge of shoulder strap in seam).